Lots of aspiring sports facility owners lack the cash to get started. If they want their own space, they start out small, or seek funding from banks or partners. A second group of aspiring owners, however, already has the cash. These owners often don’t have experience training athletes. They’re just looking for a good financial investment that aligns with their passions. I’ve worked with both types of sports facility owners for years through eSoft Planner scheduling software. However, I myself approached sports facility ownership as an investor-type. I’ve also noticed that there are investor-types involved in some way with most new sports facilities. If you’re considering investing in a sports facility — or want to get the attention of an investor — here are three suggestions. You probably already know that the best possible return on investment (ROI) depends on your getting a good price for your sports facility when you sell it. We’d all like to sell our facilities for lots of cash eventually. However, that’s not how it plays out at most sports facilities. It’s not uncommon for owners to sell their equipment for a fraction of the original cost and get little else. Your brand and client list should be your most valuable assets, but they won’t be worth much if you can’t demonstrate that you’re making money. If you want to eventually interest buyers in your business, get ready to show that it brings in plenty of revenue each month. That means starting out with a laser focus on profitability, because getting your sports facility profitable will probably be more complicated than you expect. A rental-based sports facility model looks deceptively easy to run, even for those wise enough to know to expect a few bumps in the road with any new business. Owners often overestimate how many customers will find them via word of mouth. The truth is that customers rarely find your facility without significant marketing efforts. (Related: Marketing for your Sports Facility). Plenty of people will tell you that they’re excited to use your facility once it opens, but only a small fraction will actually show up. It’s also tough to make a decent profit at a facility whose main service is rentals. The overhead costs for these facilities are typically very high compared to what people are willing to pay for facility space. 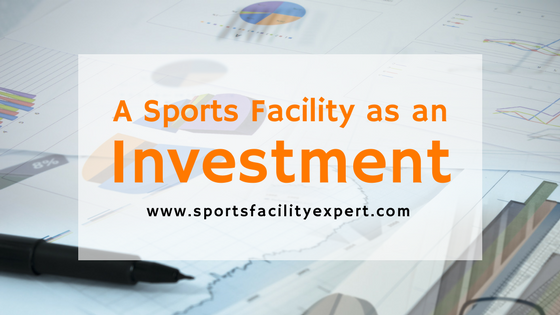 Want to maximize the ROI of your sports facility investment? Use as little space as possible and focus on group programming. Events such as tournaments or birthday parties also tend to be much more profitable than rentals. As you may have guessed, programs and events are more complicated than rentals to plan and run. That’s where owner-investors without a sports training background need to rely heavily on hired staff. For many investor-type owners, their sports facility won’t be their primary focus each day. Many of these owners have other jobs or are managing other investments at the same time. If this describes you, prepare to spend lots of time and money finding someone to run the facility. I mentioned my own struggles with finding the rigth staff in my post about selling my sports facility. All that said, a sports facility can still be a great investment. The youth sports training industry continues to grow. And as far as financial investments go, sports academy ownership can be way more fun and rewarding than a rental property or an index fund. If you want to contact me personally about the topic of sports facility investing, shoot me an email at mike@sportsfacilityexpert.com.